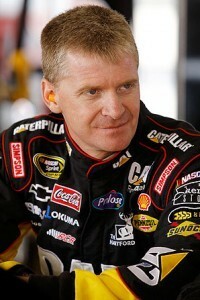 Jeff Burton’s first NASCAR victory came in the Busch Series at Martinsville in 1990. He finished 15th in the series points that season. In 1991 and 1992, Burton improved, finishing 12th in the Busch Series standings in both years. In 1993, his Cup Series debut saw him making his only start that season at New Hampshire International Speedway in July. He finished 37th after an accident which forced him out of contention after 52 laps. Burton raced a full schedule in 1994 and earned rookie of the year honors with two top-five and three top-10 finishes. Two years later, Burton joined Roush Racing and finished 13th in the Cup standings with six top-five and 12 top-10 finishes. It was not until 1997 when he pulled into Victory Lane, winning at Texas, New Hampshire and Martinsville en route to his first top-10 points finish, coming in third.